Oh yes. It’s finally here, peanut butter lovers! 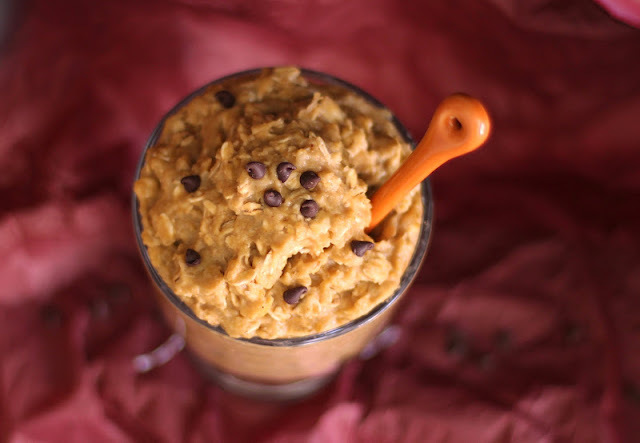 Today, I bring you this Healthy Peanut Butter Oatmeal Cookie Dough! 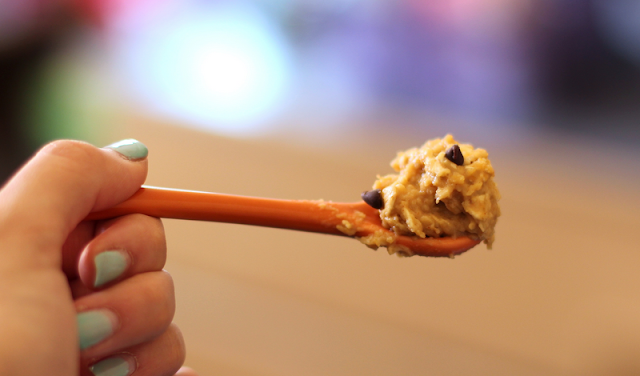 This is the answer to your insane cookie dough cravings prayers. This healthy Peanut Butter Oatmeal Cookie Dough is safe to eat raw and made with a secret ingredient! Eggless, gluten free, sugar free, and high protein! In a large bowl, stir together the oats, protein powder, erythritol, and salt. 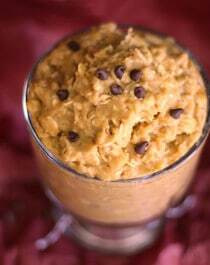 In a blender, puree together the beans, milk, peanut butter, stevia extract, and vanilla extract. Scoop this mixture over the dry ingredients and stir together. That's it! For best texture, cover and refrigerate overnight, but you can serve it immediately with chocolate chips and chopped peanuts. Recipe inspired by: Spoonful of Sugar Free. Yes, really. This deliciousness is only five minutes away from your belly fingertips! Yes, this label is legit. Impressive, right? Um, I hope a can opener is in your hand, because you better make this now! 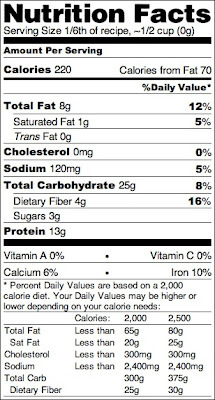 Omg, look at that protein content! Amazing! So excited to make this! This looks great. I’ve made a garbanzo-bean based cookie dough before and loved it. I’m curious to try yours! Do you think this could be made in a magic bullet? And I’m glad you asked that, because I made it in my magic bullet! Be sure to mix the mixture (rotate the stuff at the bottom of the cup to the top) as you blend because a few beans may not be reached. PS: My magic bullet is on its last legs (aka, about to die) so you might not have as much trouble. Oops! I totally forgot to add that! I didn’t mean to offend you or Katie, but it was actually inspired by another blogger. But just for clarification, I made the recipe myself and didn’t copy anyone. The only thing that’s similar is really just the PB and chickpeas. Thanks for letting me know, though, I updated the post. The title had “high protein” in it, which made me think of ways to make it even higher protein. 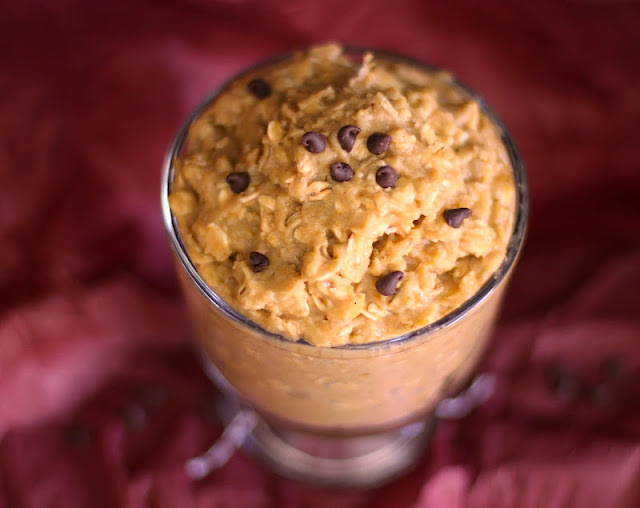 Pairing the chickpeas with oats make the cookie dough a complete protein source, whereas just chickpeas alone is an incomplete protein. I added some protein powder to increase protein content and add flavor and sweetness without using vanilla extract. Class act. Thanks for not deleting my comment or thinking I was being mean! This looks amazing! I will be making this recipe this week for sure! yum! Okay, I just made this today. I better go outside or something because the leftovers are screaming my name. can i sub anything for the protein powder? maybe like some sort of flour or something? thanks for any answers! Ok, I just died of happiness. Is this cookie dough bake-able? Or is it just for eating? Can I sub anything for the Stevia Extract? this looks awesome and can’t wait to make it! This looks like the best thing ever! Genius! What could you sub for the stevia extract? If I used powdered stevia, I assume that I need to add more wet ingredients? It depends on what powdered stevia you use. If you use the kind in the large bags that are a 1:1 replacement for sugar, I would use about 1/3 cup of it and add an extra 2-3 tbs of almond milk. If you use the stevia packets which are sweeter than sugar, I would use ~6-7 packets? This recipe is very adaptable since it doesn’t need to be baked so if you need more liquid just add it 1 tbs at a time, and if you need more dry ingredients you can add more protein powder or oat flour. I wouldn’t recommend omitting the stevia completely because then it would not be dessert-like. To me, oats and peanut butter without any sweetener can be considered a savory dish. I’m so sorry you get headaches from sweeteners 🙁 I have never heard of anyone reacting to stevia! Real white sugar gives me headaches too. If you want to add something sweet to the cookie dough I would recommend some fruit maybe? Like some applesauce instead of the almond milk (you will need a tiny bit more though, just add it by the tablespoon when needed). I hope you like the recipe! Do you think these bean-based batters can be done without beans? I’m definitely going to try the nut butter one you posted a recipe for but can something be substituted for the beans in these other ones? Like a banana maybe? I’m just having trouble jumping on the “beans-in-dessert” bandwagon. I have very sensitive taste buds and I feel like the beans would stand out too much to me, even if it doesn’t bother other people. But these look so good! But if you rinse them really well, they’re pretty flavorless. Anyways, you could definitely try some mashed banana instead. This will obviously change the flavor of the cookie dough into a banana-y flavor. Since mashed banana has a higher water content than beans, you can omit the almond milk. And, since beans aren’t sweet like bananas, you can also omit the stevia extract. Pingback: Edible Matcha Cookie Dough | sugar free, gluten free, safe to eat raw!